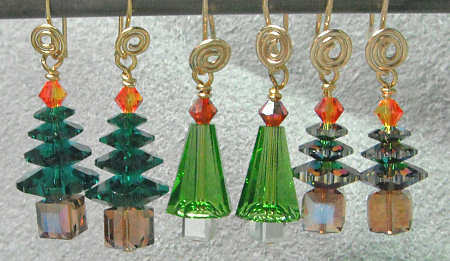 If you like instant gratification projects, Christmas tree earrings have to be close to the top of the list. They’re fast to make, fun to wear and you can make them in all colors. Greens are a natural, but don’t forget other hues! In the video tutorial you’re about to watch, you’ll see the pattern that’s been around for years, plus a pattern with a newer bead style from Swarovski. Keep in mind that while I’m demonstrating earrings, you can also make pendants based on these patterns. First, let’s go through the list of supplies needed for these earrings. For both patterns I used 3mm headpins. You’ll also need a pair of round-nose pliers, and I also suggest a pair of chain nosed pliers to help with making the wrapped loop. For colors — that is totally up to you! In pattern #1 I used emerald green for the tree, fire opal for the bicone and light topaz for the cube. In pattern #2 the artemis is fern green, the cube silver and the bicones once again fire opal. Now that I’ve listed the supplies, how about the tutorial itself? Glad you asked, because here it is! I hope you enjoy it, and that you’ll create a multitude of trees for your holiday! And as always — if you like this tutorial, go ahead and give it a “like” (thank you kindly). Great video….I am making these for all my female family members and several friends. Thanks for sharing. Glad you enjoyed the video! 🙂 I had fun making it. Hello, loved your video! I am new to this and will attempt the angel and christmas earrings as my first projects. Your video made me feel as if I can do it. Thank you for such clear instructions and materials used. What are the details of the head pins used and also the ear wires? Hi! I pretty much only use 2 inch head pins. As far as ear wires go, you can use whatever you like best.